So having returned from Spain just in time for Blizzards to envelope the Costa Blanca. It seems appropriate that the the weather goods have shone on me for a couple of days rock climbing. After attempting tremadog I pulled the shear desperation card of heading to the Lleyn. Where Jez and I climb the spectacular Samurai. This is a great E2 and well worth seeking out. It climbs over 7 overlaps yet never really gets steep. The rock is a micro granite and the main gear is a couple of quarryman shot holes that form great threads. Although you need RP’s and cams to get around the rest of it. 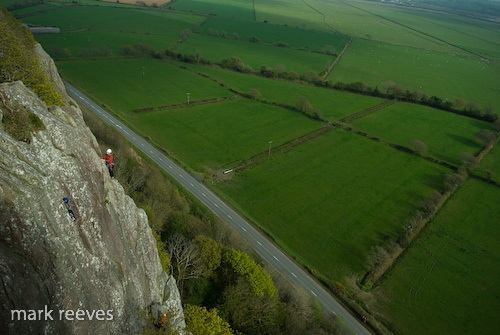 Two days later and I head back to tremadog this time the weather was fine. The wind was blowing over the top of the Crag and Owen and I quickly climbed Kestrel Cracks a stunning HVS, that I think has been rescued from the brambles recently. We then climbed the first pitches of The Ned into Broken Edge, giving a stunning two pitch E2. The first being technical and sustain and the second exposed. I don’t have v any photos of this because I lost my small camera working at the weekend. I was gutted to be honest, but some kind person on UKC posted up finding it and I have now been reunited with it. All I can say is there are still some beautiful people in the world.